Fall sports mean fall grilling and adobo pork chops (or chicken breasts) are a flavorful alternative to hot wings. Nothing against you, hot wings, but sometimes we need to take a break and see other foods. Admit it, hot wings, things have been getting a little dull and we need to spice them up. It’s not you, it’s me. This recipe is an adaptation of a recipe originally printed in the Officers’ Wives Club Cookbook from Clark AFB in the Philippines. This recipe requires advance preparation. Prepare the marinade by combining all of the ingredients in a mixing bowl. Trim most of the fat from the pork chops and score the remaining fat. Place the chops in a resealable plastic bag and add the marinade. 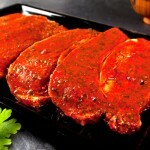 Squeeze the air out of the bag and marinate the chops, refrigerated, at least four hours or up to eight hours. Remove the chops from the marinade and pat dry. Discard the marinade. Season the chops with salt and pepper. Prepare the grill for medium-high direct cooking. Place the chops on the grill and cook, covered, about six minutes per side or to an internal temperature of 145 degrees F.
Remove the chops from the grill and bring into the kitchen. Tent with foil and allow the chops to rest for five minutes before serving.